Mr. and Mrs. Wright, of Woodhouse Road, Quorn, have received official intimation that their only son Squadron Leader Charles Leonard Wright, has been reported missing following operational flight in North Africa. 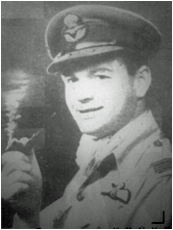 Squadron Leader Wright was educated at the Loughborough College School and later joined the staff of the Loughborough Echo as a journalist. During that period he was a very popular member of the Looughborough Rugby Club and the Loughborough Boat Club. He joined the R.A.F. and did his training in Egypt. For two years he had been A.D.C. to Sir Miles Lampson, British Embassador in Cairo, relinquishing that post in order to return to flying duties. He had been stationed in Egypt for six years and prior to his appointment at Cairo was with a bomber squadron in the Middle East.